People and events mentioned in the book "Seeing Red"
Red Porter knows the difference between right and wrong, black and white. But he also knows that for folk in his hometown, Stony Gap, this isn't always clear. When Red's daddy dies, he's left with his younger brother, his mama and some hard decisions. As their money dwindles, Red does everything he can to keep the family repair shop afloat. 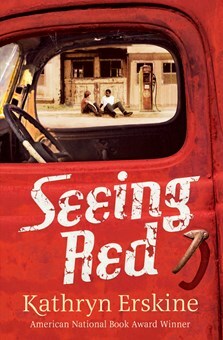 But when he uncovers some of the racial injustices that have been happening in Stony Gap since before he was born, Red is faced with unsettling questions about the legacy behind his family's shop... With the help of a few unlikely characters, however, Red realizes that while he can't fix the past, he can still change the future and stand up for those who need him most. Folks don’t understand this unless it happens to them: When your daddy dies, everything changes. He’s not around any more to teach you how to drive a truck when Mama isn’t looking, or tell you man stuff that J isn’t old enough to hear, or listen to you holler when you’re mad, and say, “I hear ya, son,” while he lets you figure out what you’re going to do about it. Even if your brother is seven years old, he goes back to being a baby and acting more annoying than usual. Your mama turns into some kind of zombie, walking around aimlessly, in between fits of crying. And you want to cry, too, except you’re the man of the house now and you know your daddy said he could always count on you, so you can’t let him down. porter’s: we fix it right! That’s what the sign above our car repair shop says. It was the truth, too. Daddy said us Porters had been taking care of vehicles around Stony Gap ever since cars were born. That’s how come our street is called Porter’s Shop Road. Daddy could tune an engine, fix a flat, smooth your dents, jump your battery – he even managed to keep Miss Georgia’s Rambler running, and that sickly old thing was held together with spit and prayers. I didn’t know how anything could get fixed right again, now that Daddy was gone. Why couldn’t the doctors fix him? How hard could it be to jump-start a heart? I closed the shop door behind me and pushed the hair off my sweaty forehead. “It sure is a hot one, isn’t it, Daddy?” Inside the shop I could talk to him out loud and nobody heard me. Not that there was anything wrong with talking to him. Heck, Miss Georgia still spoke to her husband and he died about thirty years ago. I walked up the stairs in the back where Daddy had his office, taking in a deep breath of everything I loved. The shop was oil and gas and paint and dirt. It was brake pads, hoses, filters, and about any kind of tool you’d ever need to fix a car or truck. It was Lava soap, old rags, and a sink with a tap you could turn on with just your elbow. It was the last place I saw Daddy. A shotgun went off across the creek, and I jumped. “It’s Mr Dunlop,” I said, “after those raccoons again.” As if Daddy wouldn’t know. I wanted to close the window and block out Mr Dunlop’s hollering even if the August heat killed me. But I sat back down when I heard Beau’s voice rising from the What-U-Want – our convenience store, singing that hymn Rock of Ages. It was good to hear some singing coming from the What-U-Want, even if it left a lump in my throat. Daddy used to sing there all the time. And he used to sing to drown out Mr Dunlop, just like Beau was trying to do. I heard a car crunch onto the gravel between the house and the shop, and I sat up straight. Me and Daddy always tried to guess the type of car by the sound it made. He called me the Boy Wonder of Cars because I have a knack for understanding them. I guess it’s in our blood. I listened to the car door as it opened and slammed shut. It wasn’t as heavy as a pickup. It wasn’t a high-performance car like a Corvette, either. “What’s your guess?” I asked Daddy. The kitchen screen door whined open, and Mama’s voice gave a shaky hello. After that she called, “Red? When I opened the door, dust was still settling from Mr Harrison’s ’71 Chrysler 300. “Yes!” I couldn’t help smiling because Daddy would be proud. Ohio? What was he talking about? We hadn’t been to visit Mama’s family in years. Besides, they’d come to the funeral not two months ago. And with only me and Beau to run the shop and the store, it seemed like a funny time to go on vacation. The screen door banged open and J screamed, “Ma-maaaa!” even though she was standing right there at the bottom of the steps. “The TV’s all fuzzy and I cain’t see a thing! I wanna watch The Flintstones!” He was half naked, wearing only his green briefs, and he leaned his head so far back, bawling, that his curly black hair touched his bare shoulders. “It’s all right, baby, I’m coming!” Mama looked at Mr Harrison, then me, and said, “Just give me a minute.” I wasn’t sure which one of us she was talking to, and she ran up the steps and into the house, her wrinkled black dress disappearing behind the screen door. Mr Harrison puffed his fat stomach out and looked everywhere but at me. It was like I had some disease and grown-ups didn’t know what to say or do around me. So I looked at his car. He could afford a new one every other year seeing as how he was both a real-estate agent and an insurance agent. He had what Daddy called a “healthy business”, which is a polite way of saying he was rolling in dough. Daddy said there were only two things slimier than Mr Harrison: a leaky oil pan and a big-city lawyer. Mr Harrison stared at me for a moment. His eyes moved over to the What-U-Want and back to me, like he was deciding which was worse, having a dumb kid change your oil or a retarded grown-up. Not that I thought Beau was a retard, but most everyone else did. Daddy said Beau might be on a different track from the rest of us but sometimes he was way ahead, and that Beau’s mind raced around so much, you could get whiplash just trying to keep up. Finally, Mr Harrison made his choice. “Beau!” He yelled so loud Miss Georgia could probably hear him even though she lived half a mile away. I heard the jangling bells on the front door of the What-U-Want and Beau’s lumbering footsteps coming down the stairs and across the gravel. A couple of minutes later, the three of us and the Chrysler were in the shop. Mr Harrison was stuffing his red tie underneath his vest but there was barely enough room in there for him, never mind his tie. “Yes, sir,” Beau said, “Red is real good at oil changes. I-I think he might could be better than me.” He fingered the fancy red letters Mama had sewn on his shirt: beau. “Plus, I should go back to the What-U-Want.” He said it almost like a question. Beau coughed and tugged his hair again. The truth was, I’d just turned twelve. “Well, I’m a good solid twelve, and I’ve been changing oil since I was nine. By myself.” I wanted to say, Who do you think has been changing your oil for the past three years? How come when it’s something you want to do, grown-ups say, “You’re only twelve,” but if it’s something you don’t want to do, like homework, it’s, “You’re almost thirteen years old, for heaven’s sake!” and they act as if you ought to have been doing it since the day you were born. “I can hack it,” I said loudly, and picked up a new filter from the shelf for a ’71 Chrysler 300 and the right-size wrench, along with the oil pan and some rags. “Almost done, Beau,” I said, screwing on the oil cap. “Red?” He said it so pitiful, my scalp prickled. I turned around fast. He was tugging at his hair with both hands and his face looked fit to start bawling. “Out there.” He looked over to where the pounding was still coming from. “Your…​your mama…” We heard a few more taps. Like the final nails going into a coffin. I felt as if my insides were turning to ice and I froze for a moment. Then I pushed past Beau and ran out the door. I stopped dead when I saw Mama. She was standing there with Mr Harrison. There was nothing wrong with her. It was the sign that was wrong. The new sign in front of our house. For sale. Kathryn Erskine worked as a lawyer for fifteen years before realizing that her real passion lay in writing. Mockingbird, her first novel to be published in the UK, won the National Book Award in America in 2010, and garnered wide critical acclaim on its publication here in 2012. Visit the author’s website, www.kathyerskine.com, for more information. This is a powerfully moving story, very disturbing in parts but generally uplifting, showing good and bad aspects of human nature. It is full of twists and turns that will keep you gripped to the end. This is one of those rare books that pull the reader straight into a masterpiece of writing. Seeing Red works on more than one level. It is a coming of age story. It is also an historical novel which accurately depicts the issues of the time... the powerful story, lively cast of characters and historical details draw you in. This is a story about coping with grief, learning to respect differences, hitting back at bullies and fighting the evils of racism... A thoughtful, emotional and inspiring story. A high-octane read with some unforgettable personalities. A totally convincing immersive read.